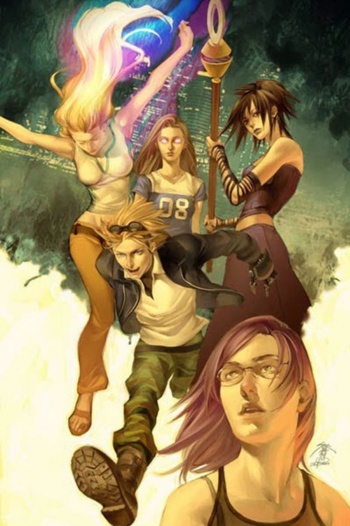 Brian K. Vaughan's Runaways might one day join the Marvel Cinematic Universe, but not until Phase 3 at the earliest. With Guardians of the Galaxy and Ant-Man joining the Marvel Cinematic Universe, Marvel seems willing to bring several obscure characters to film. For comics readers, that's a good thing, because there are many lesser-known titles we'd love to see on the big screen. High on that list is Runaways, a series about teenage superheroes confronting supervillain parents that actually came close to getting its own movie. So why aren't the Runaways part of Marvel's film canon yet? According to Iron Man 3's Drew Pearce, who also penned the Runaways script, it's because the project was shelved so Marvel could focus on the Avengers brand. "We were really close to being made, and then this movie started to happen called The Avengers," Pearce told Jeff Goldsmith during a Q&A podcast. "Oddly, it pulled focus from the unheard-of brand Runaways, and it really did kind of consume the Marvel Cinematic Universe. It's there ... maybe it'll be a Phase Three movie. I really hope so. I'm really proud of it and I think it'll be a brilliant film, but I think it all depends what Kevin Feige, the president of Marvel, his master plan is." Runaways was created by Brian K. Vaughan, introducing a group of teenagers who discover their parents make up a powerful supervillain cabal. After running away from home, the Runaways end up confronting canonical Marvel villains, bounty hunters sent to retrieve them, and even superheroes concerned about "gifted" children wandering the streets. The series was praised for its unique premise, strong writing, and well-rounded teenage characters, over half of whom are women. It's a little disappointing that Runaways never got a feature film, but I'd say it has a very strong chance of being considered down the road. First of all, teenage superheroes are one of the few genres Marvel Studios hasn't covered yet, and Runaways nicely fits the bill. Second, a Marvel-oriented Runaways makes more sense once other movies have established canonical backstory, which is much easier post-Avengers. Third, Pearce has proven himself a capable writer with Iron Man 3, which may convince producers to give Runaways a second chance. Finally, Joss Whedon himself wrote Runaways after Vaughan's departure, so if anyone knows how to tie Runaways with Avengers, it'll be him. That's not to say a Runaways movie should be expected anytime soon. "They make two [movies] a year," Iron Man 3 director Shane Black reminded, "but that's still at least three years down the line." In other words, once Avengers 2 is out of the way, Marvel might consider giving Runaways its shot.